COSTA MESA, Calif. (AP) — The Los Angeles Chargers have had five kickers since the start of last season. They soon may be looking for their sixth. 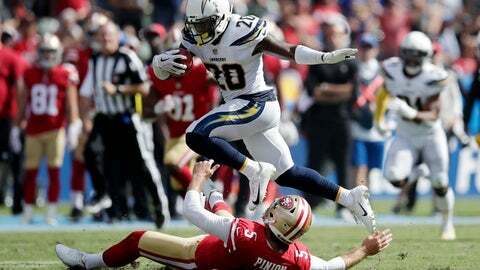 Coach Anthony Lynn said Monday that he is evaluating the kicking game after Caleb Sturgis missed a field goal and two extra points in Sunday’s 29-27 win over San Francisco . Lynn did not place all the blame on Sturgis, but he also hasn’t ruled out bringing kickers in for tryouts as the Chargers (2-2) prepare to host Oakland this week. “We are looking at the entire process. We’ve had the snapper and holder here the entire time. It can’t be that all these kickers are bad,” Lynn said. Long snapper Mike Windt is in his ninth season with the Chargers and is among the team’s longest-tenured players. Punter Drew Kaser also handles holding duties but Philip Rivers was the holder during the second half of a Week 3 loss to the Rams when Kaser was injured. The Chargers have the lowest accuracy rate on extra points (84.3 percent) and field goals (69.2 percent) since the start of last season. As much as Lynn would love to maintain continuity, he is evaluating everything in order to get things on track. Sturgis is in his sixth season in the league and signed as a free agent after three years with Philadelphia. He is seven of nine on field goals but six of nine on extra points. Sturgis came into the season with only four misses on 70 PAT attempts since 2015. He said the reason for the three missed on kicks Sunday was that he needs to hit the ball more solid. It wasn’t an awful day for the entire special teams unit. The Chargers found another punt returner after Desmond King averaged 20.5 yards on four returns. His 55-yarder late in the second quarter helped set up a Sturgis 48-yard field goal to tie the game at 17 at halftime. King said he didn’t find out until Saturday that he was going to be returning punts due to a nagging foot injury to Travis Benjamin and JJ Jones being inactive. The second-year cornerback, who returned punts at Iowa, will have the job for at least a couple more weeks. Lynn said King is not explosive as a returner, but he can run through tackles and pick up a lot of yards after contact. Notes: Defensive tackle Corey Liuget returned to the team complex after serving his four-game suspension for using a performance-enhancing substance. Liuget said he worked out in San Jose during the suspension and is hopeful of being in the lineup against the Raiders. … Offensive tackle Russell Okung will be evaluated later in the week after missing the second half against the 49ers due to a groin injury. If Okung is unable to play, Sam Tevi would move to left tackle and Trent Scott would play right tackle. … Linebacker Kyzir White had knee surgery on Monday. Lynn said it was a minor procedure and he didn’t have a timetable on how long White would be out.